The letter F goes to the heart of what we do: Family and Family History. F is for Family: the people you’re doing this for – the family descendants long into the future, our siblings, children and grandchildren. An aide memoir: it will be no use to them if we don’t leave our research organised and written up in such a way that they can benefit from it. F is for Family: I just said that, right? How about the families you’re researching? Who are the people you’re trying to learn more about? This all seems moderately self-evident but along the way you’ll need to make some decisions about your personal definition of family. Are you going to include only biological members of the family and if so will you include those who’ve perhaps been fostered or adopted out? 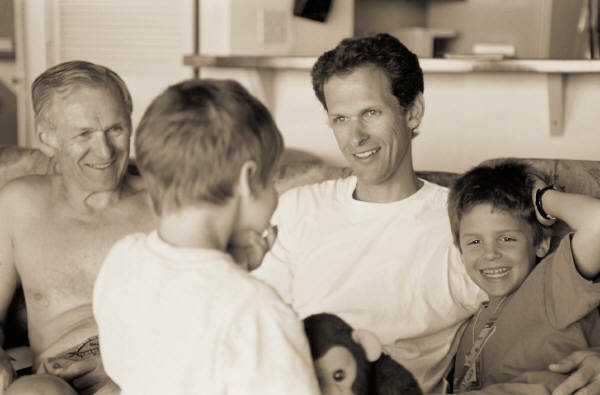 What about children who are adopted into the family and who are naturally treated day-to-day as part of the family? I faced these questions when I wrote my family history and regard this as a critical consideration. For myself I wanted to include anyone who was born to a family member or who had been assimilated into the family. Only you can make these decisions. Of course you can also be misogynistic and only include the men and name only the women as they are born then ignore them for ever after. You won’t be surprised this was not my method even though I have been given a family tree exactly like this. F is for Family Support: There is not a doubt in my mind that most of us rely on our other halves/family members to support us in this quest, to listen as we rattle off our recent discoveries, to humour us in our never-ending pursuit for information, not to mention driving us to cemeteries and hopefully joining in the search. Much of it may be a mystery to them, but they’re there for us and can be a great cheer squad. Thanks Mr Cassmob! F is for Focus: You know those days when you’ve been on the computer too long or at the archives all day. Your eyes and mind start to wander and it’s all too easy to miss that pivotal clue, so taking a break may actually pay off so you can regather your focus. Of course when you’re down the hole after the rabbit no one has a chance of breaking your focus, let alone getting your attention. F is for Forensic Skills: You don’t need to know what you’re looking for, so they tell us. Well unless you acquire some forensic skills along the way you may well end up with a very strange tree. Each piece of information we acquire needs to be assessed in the context of the other documentary evidence and weighed up for accuracy and reliability of proof. We need to have the willingness to test our findings or those oral history stories against other evidence. Then we need to ferret out those titbits that are hidden away in esoteric places like archives, museums and libraries and again weigh up their merit. It becomes a dance of information which only our increasingly discerning skills can bring together to tell an accurate story. Really it could be Q for Questions as much as anything as we keep querying our research to build our family’s history. I was very tempted to trash the misogynistic chart but decided to keep it for “posterity”. Tangents are a temptation to all of us, and sometimes we find good clues when we’re being tangential. Family, focus and forensic skills – you’ve nailed it!! Good post. The question of who to include and who to leave out can provide some interesting dilemmas. As to focus – I get lost in the rabbit warren too often. Very true that we can make better progress by stopping for a break and picking up again with a clearer focus. Two good additions to the list Sharon! I liked your delineation or lack thereof of family — actually more to the point that each of us must make those decisions of who is family, now, then, and evermore. If not the decisions are made for us — and not necessarily what we would want. A F-ing good post- — I dinna mean to be vulgar when I wrote it, but so it appeared –Sorry. I’m trying to visit all the participants of the 2012 A to Z Challenge and I have arrived at your lovely blog. Good luck with the rest of the year!